Today, we finally got a chance to try out my new variant of the excellent 'What a Tanker' game. It covers the Arab - Israeli wars between 1948 and 1973, which of course includes 1948, 1956, the Six Day war, Yom Kippur, the Water war and the War of Attrition, and the various 'Battle Days' the Syrians held, and the Syrian attack on Jordan in support of the Palestinian insurgency. Plenty of scope for gaming there! We tried 4 games, but I have only decided to inflict 2 on you!!! For our first game, I and the AI (solo system) ran M50's armed with 76mm guns. Phil used the M51 with the French 105mm gun. The terrain was our desert terrain, which is passable for the Golan Heights! Well, it gives the feel!!! Lawrence found the dice - difficult! His T-55 commander was sitting looking through his scopes, and refused to move! Phil got his Isherman on the move toward the Syrian. I had a lot of 1's on my command rolls, and raced forward. I managed to get into a position to see the enemy. The AI also got the other M50 onto a hill overlooking the Syrian. Phil got the other M50 to run, the AI took a back seat! Lawrence's tank looked around for another target. The T55 started moving forwards. ...amazingly he managed to damage the optics, together with the bad optics of the T55, this would make it tough for him to hit. My tank began to move as he couldn't see the T55. The squat Russian tank was proving hard to hit! Lawrence decided to move to engage Phil and get out of my firing line. He got half way, but then his vehicle stalled! I took the opportunity of trying to get behind him! The T55 was soon moving again though. Phil was still getting shots off. Fortunately, the damaged Syrian was not able to spot his assailant. Fortunately, he couldn't see me or I would be toast at this range! My shot bounced off him and damaged a wall! Alerted, Lawrence turned his tank to face me. My M50 retreated to cover in haste! Aw, shoot!. He brushed the shot off like a gadfly! Phil got a damaging shot from its rear. Lawrence was bracketed now with reduced command dice, so made his escape. So, a Syrian victory? - perhaps. ...and Lawrence traded in his damaged T55 for a T62! Phil headed for the hills! The T62 sat like a fat spider waiting for a fly! I got moving, though not as far as my dice should have allowed! The '62 got off the mark and advanced. Mt tank trundled forward hoping to get round the flank again. The T62 suddely raced forward, appearing in front of my tank! Fortunately, he couldn't shoot too! He had a shot at the flank of the Syrian. A direct hit! The T62 was destroyed! So, apart from the slight modification to the AI Tanker rules that was suggested, I think its working fine! 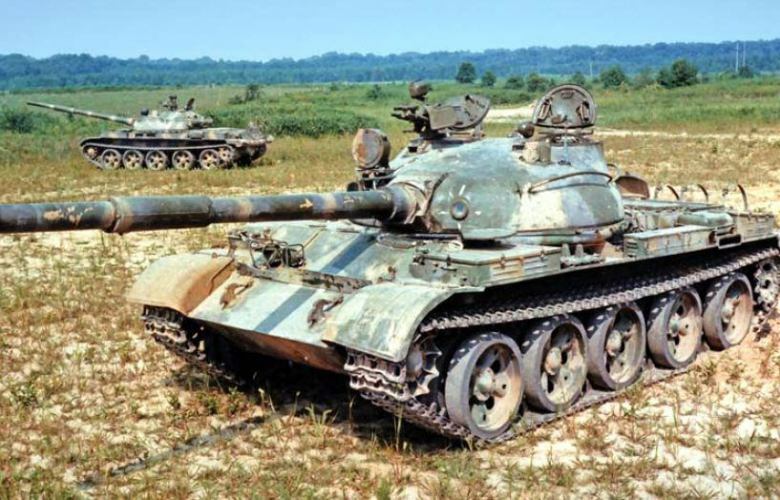 T-34 85's and Panzer IV's ?